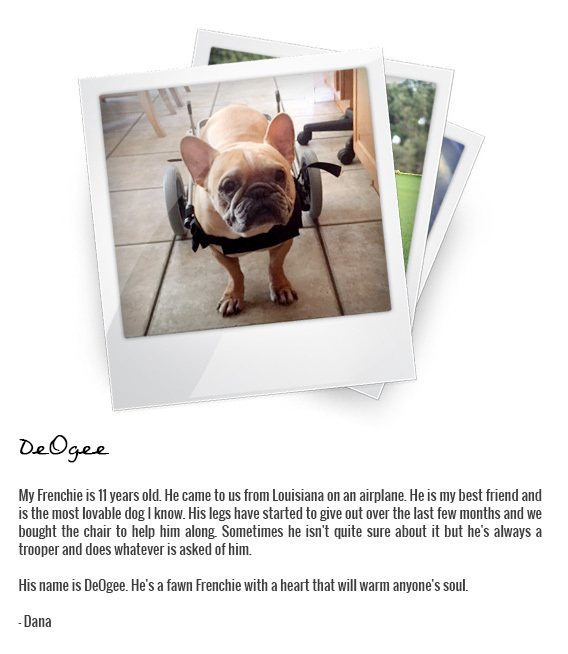 This page is dedicated to pets that continue to inspire us despite their disabilities. 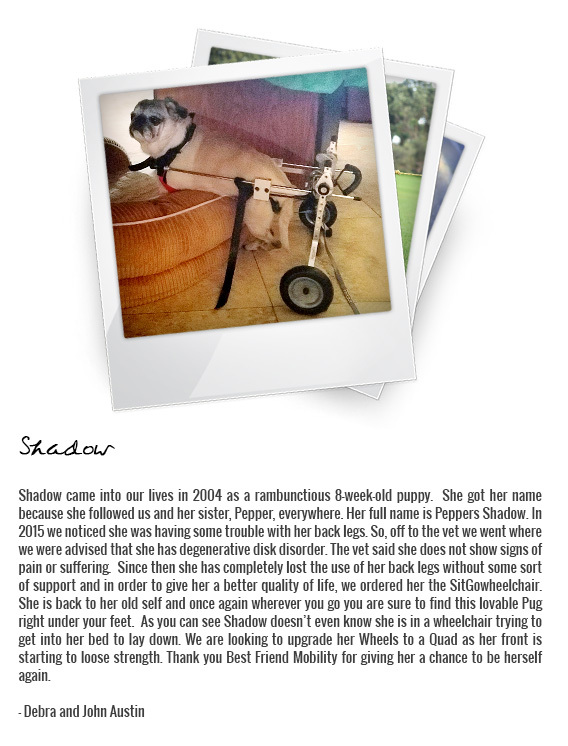 Taking care of our handicapped pets isn’t easy but that’s no reason to give up. With love and support, our pets’ lives can still be filled with fun activities and play. 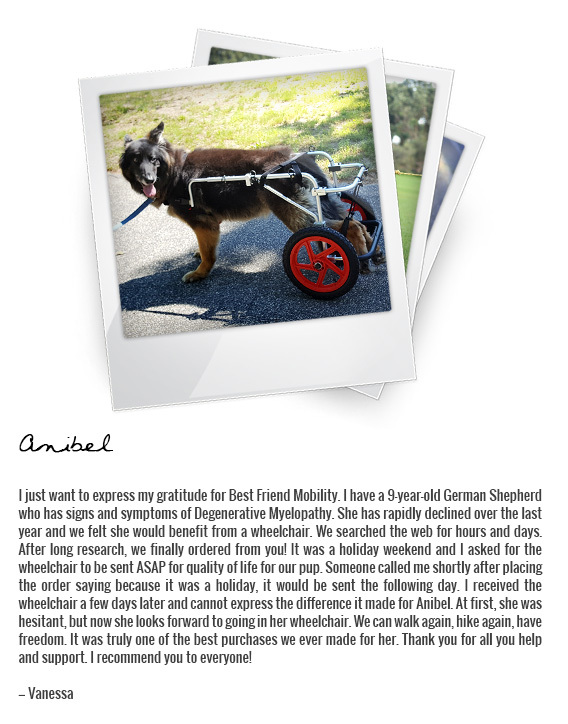 Here at Best Friend Mobility, we’re doing our best to make things a little bit easier through our products and through sharing stories and support. 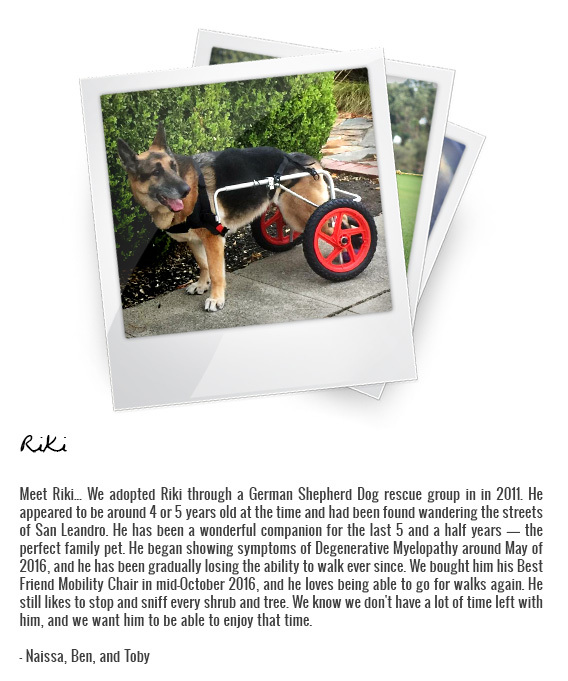 Meet our latest heroes—both of the four- and two-legged variety. Pastor was a competent shepherd dog for 10 years and served our family and flocks with joy and a sense of loyalty and responsibility you will rarely find in humans. This SERRA DA ESTRELA (Portuguese big breed) stood by my side for a whole night defending me from wildlife and keeping me warm after I bumped my head on a boulder during one of my seizures and passed out. It was thanks to his diligence and constant barking that a search party found me the next dawn, freezing and bleeding in the middle of the woods. I read a lot of reviews in your site, often about company dogs. Pets whose only job is to keep their owners company and bring some joy to their lives. Pastor was not a pet, he was a working dog, and in 10 years of remarkable dedication, he earned his place in the canine wall of honour with flying colours. After 10 years, he became ill with genetic hip wear. That’s when we felt the obligation to care for him and pay in kind and love those years of hard work and unconditional fidelity. About 40 years ago, my father made a makeshift walking chair for another dog. Unfortunately I didn’t inherit his expertise and so I found myself searching for an apparatus that would allow Pastor to keep some quality of life and let him take an occasional walk with the rest of the pack, since attending to the flock was no longer an option. I will forever be grateful to BFM for allowing us to share some unforgettable moments of joy and companionship in the last few years of his life and for giving me and this best friend of mine the opportunity to enjoy some well deserved walks and play time. Thanks to your contraption he maintained dignity and the respect of the pack until the day we were forced to put an end to his constant suffering. In the last walk with his BFM, some minutes before receiving his final prescription, he still tried to bark and run after his son who was neglecting his guard duties. This is Axl a.k.a. “Budsy.” He is an 11 1/2-year-old brindle boxer. We got him as a 3-month-old puppy when we bought our first home. My husband and I don’t have any kids, so our 2 boxers are our children and they are very spoiled! Axl and his best friend Ruby are such fun, loving, and well-behaved dogs. 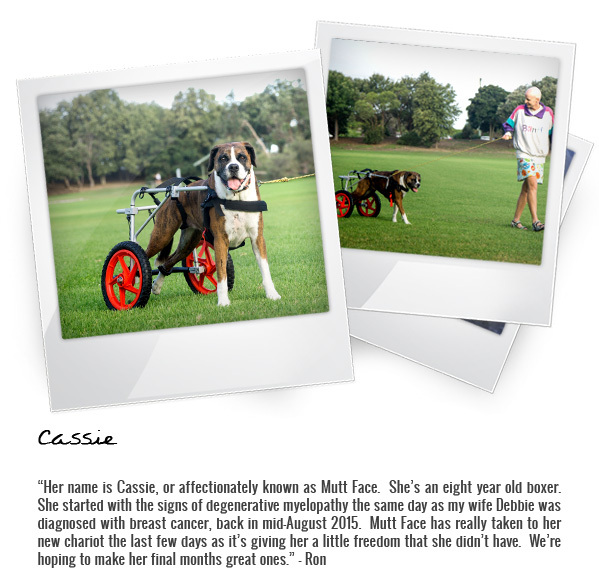 Over the years they both have had multiple surgeries to remove cancerous lumps. Unfortunately, the breed is susceptible to a handful of health issues. Right after Axl turned 10, one of the lumps grew back on his front right leg. After removal, the biopsy came back and showed that it was an aggressive cancer and that, even after multiple tests, they could not determine what type of cancer it was. We started him on a low dosage chemo pill to try and fight it. The vet stated he had approx 6-9 months to live. Two months after we started him on the chemo, we discovered blood in his urine. After successfully treating that condition, he started showing signs of degenerative myelopathy. At first his back legs would get tripped up and now it’s progressed so much that his back legs do not work at all. Despite his numerous ailments, Axl is still a happy dog and hanging in there! He continues to go to his vet every 3 months for checkups and is healthy enough to continue his medication. Eating is still his favorite thing to do next to being in his backyard. 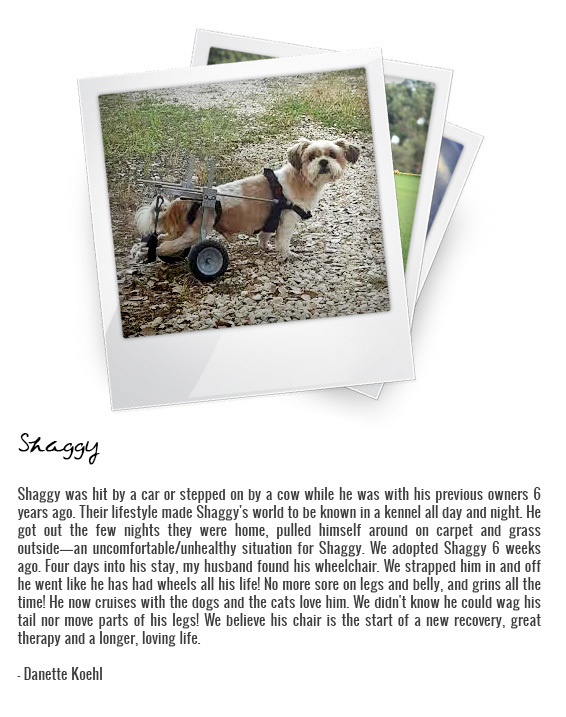 We bought him the wheelchair cart to try and help give him mobility so he can continue exploring his backyard. Although he cannot try to catch any rabbits or groundhogs anymore, he can still get around and have some fun! My lovely Stubby was the first born to a litter I had in 2007. From the very beginning when she popped out I truly knew she was going to be a very special girl. So because I expected not to have another litter, and my cousin Peggy had always expressed an interest in a boxer, my cousin decided to take her. When my cousin took her we agreed that if for some reason she would be unable to care for her, she would return her to me. They only had one year together until my cousin was diagnosed with cancer and passed away. 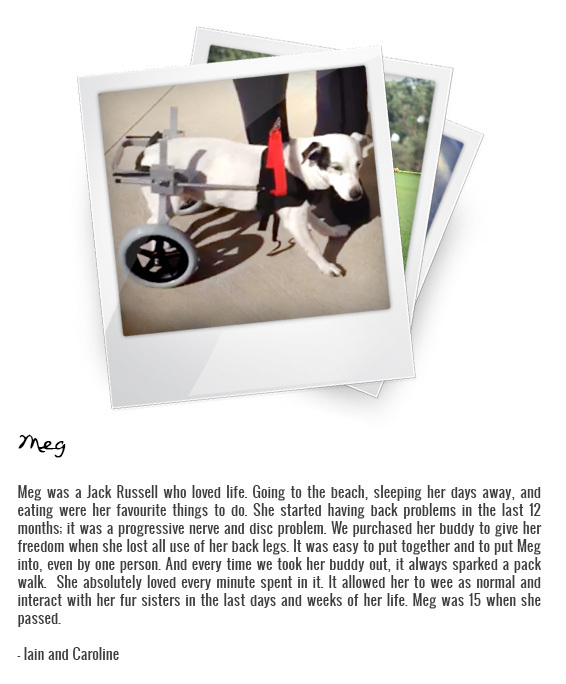 Stubby gave her the most loving companionship that Peggy needed during the final year of her life. Because of this, when Stubby came back to me she needed lots and lots of love and attention. I took her everywhere with me: to our cabin, to car shows, visitations at nursing homes, etc. She was even our greeter at our annual family/friend Christmas Party too. She did everything with me. She had a great desire to be right by my side, always wanting to be right in the middle of everything. She loved to be around people and people loved her. In September of 2017 her gait began showing signs of wobbling and lameness. We had visited our vet and was immediately directed to a diagnostic emergency facility for more evaluation. At that time they indicated she had bone cancer and had found a lump near her spinal cord. This did not slow her down, although her hindquarters became totally unusable. 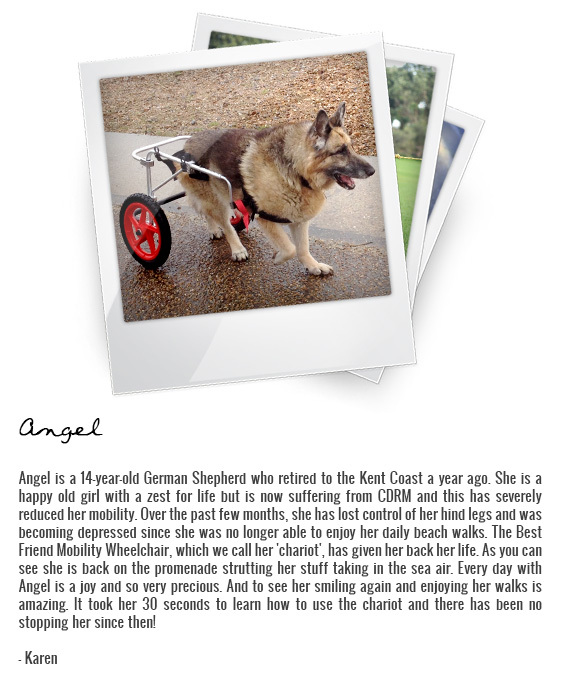 But her personality and alertness were never affected by this disability. She would manage to drag herself to us no matter where we were. That is when we found and purchased your cart. She adjusted immediately to the cart and she continued to follow us wherever we went. She no longer had a disability that was holding her back! The cart was so light in weight and easy to manage. In fact, I don’t think she even knew the cart was helping her. She continued to live life the way she always did and with ease. The cart provided her with the flexibility to follow me everywhere! I was so grateful for the extended quality of life she had because of the cart. Unfortunately, we lost her on March 5th 2018 – just a week after her 11th birthday. But I would do it all over again and I highly recommend the cart to anyone who has a need to assist their precious pets at any age and regardless of the circumstances. 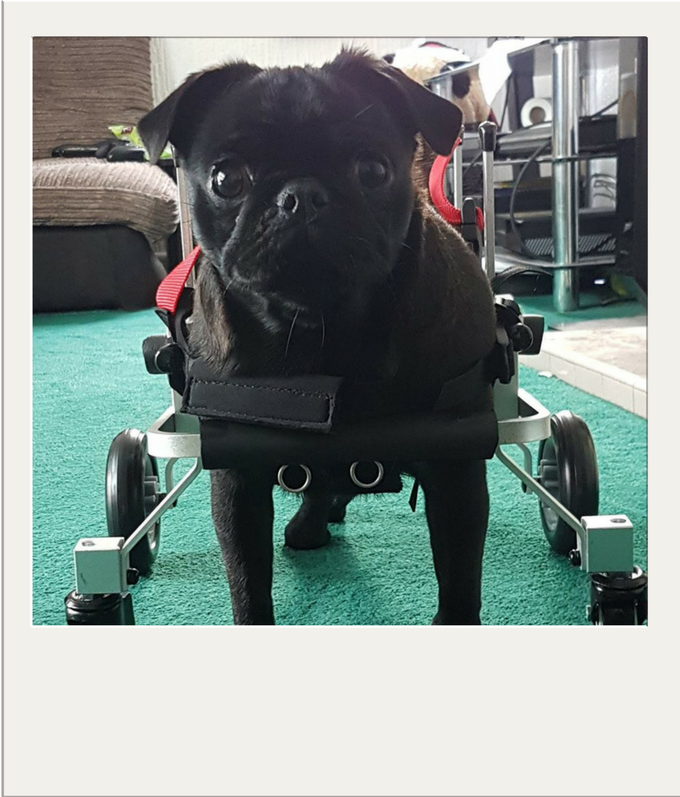 They are so affordable and the cart gave our precious Stubby the freedom she so was used to and more comfortable final months. My girl Stubby is now the poster child on my Facebook page and will forever be in my heart. Thank you! Brooklyn (a.k.a. BooBooDog) picked me. I had provided transport to the shelter for the surrender of an abandoned cat. While my friend was filling out the paperwork, I wandered the halls looking at dogs. I had adopted my first dog less than a year prior and wasn’t planning on another but this sweet girl was determined I was taking her home. She was about six months old and based on her paperwork it looked like she had a rough start in life. After returning to the shelter a couple of times and taking my dog to meet her it was clearly a great match and I brought her home. She was the perfect dog. She loved all people and animals. Kids were extra special to BooBoo. In her later years she started to have back end problems and limited mobility. After trying acupuncture, chiropractic care and laser therapy, I purchased the Best Friends Mobility Cart. She loved her walks and it had gotten to the point that she could only go to the end of the block and back. Her cart blessed her with longer walks. We only used it for a few months as we had to say goodbye to her almost two weeks after her 15th birthday on August 1st. It brought an old dog some happiness and I’m so glad I found it. 19-year old. Newfound Freedom. His name is Youji. We got him as a puppy. He just turned 19. His back legs are the only thing not working. He is not ready to give up. That is why we bought the wheelchair. He was so happy to walk without falling or having us slowing him down with a sling. Today was the first day he has run in 6 months. My heart is filled with gratitude I can’t thank you enough. I rescued junior when he was 7 years old. He was used as a bait dog then spent nearly 3 years in kennels until I found him. Junior loves his walks and he has walked for miles with me all over the country, until last year when he suddenly developed a disc problem slipping into his spine. This affected his hind legs and he couldn’t manage to walk for even ten minutes! Junior is only 11 years old and he became very depressed. Until we got his wheels! These have been amazing and as soon as we put junior in them, he was off! He loves them and he can now enjoy his long walks again. We picked out Kendall the Dog at the shelter 12 years ago at 6 months; we figured it was meant to be because my husband is also named Kendell–since termed Kendell the Man. We were told he probably had hip dysplasia. For the past 12 years, he’s been just a joy to have around: gentle, funny, sociable, protective and active! We live on Lake Superior and his favorite thing is going to the beach! He even learned to be a good swimmer. So, last October, when his back legs stopped him from standing up, we thought it was the end. We grieved for about a week; then we noticed that aside from needing help standing, he was his same old personality, healthy otherwise. 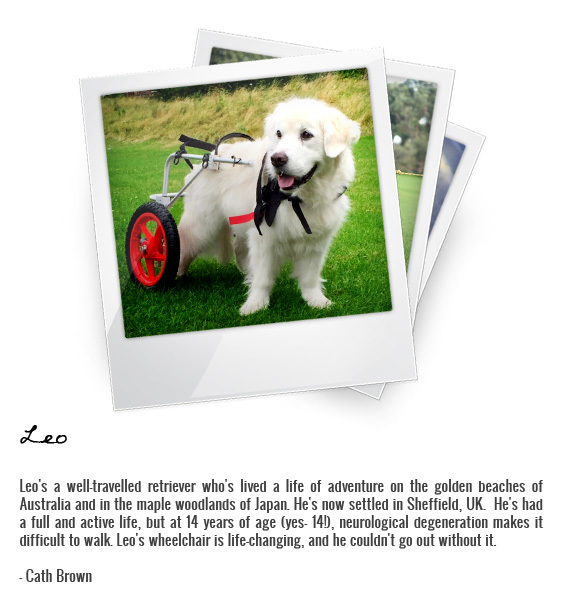 So, we set out to get him some ‘assistive devices’ and learned a lot! Along with this cart, he wears a front and back harness that enables us to assist his movements. As you can see in the video, he got to the beach! It’s good exercise and mentally stimulating when he uses it. 5 months later, we are still enjoying his company and appreciate every single day. Bananas came into our family as a Christmas gift for our son when he was four years old. She’s now 12 years old and hip problems have limited her mobility and caused her hind legs to get weaker in the last year or so. It got so bad that we had to get a harness to hold her up when walking her. The vet encouraged us to walk her more but it was tough to hold her up for very long, so Bananas couldn’t get much exercise and her legs just got weaker. We ordered the Best Friend Mobility wheelchair and as soon as we buckled her into it, she headed off across the yard with no trouble. 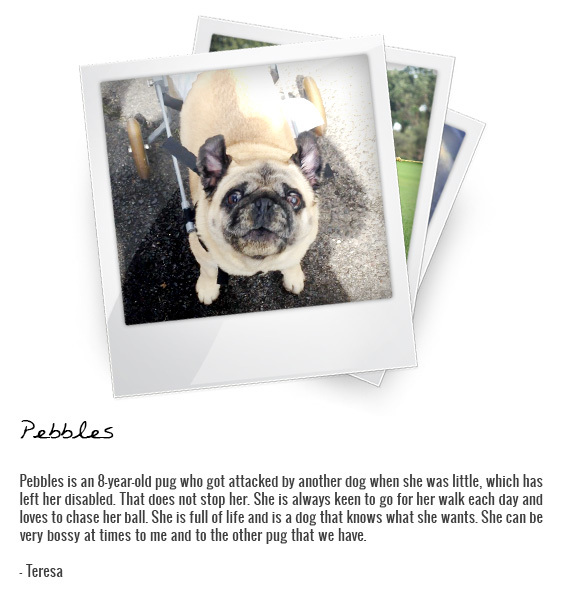 She was able to take longer walks and spend more time outside which she loves. 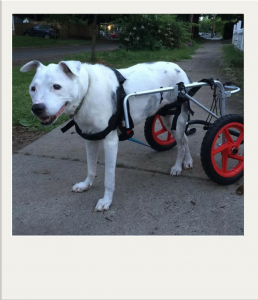 After a couple months of walking with the help of the wheelchair, she has built her strength back up and now she’s able to take short walks without it. 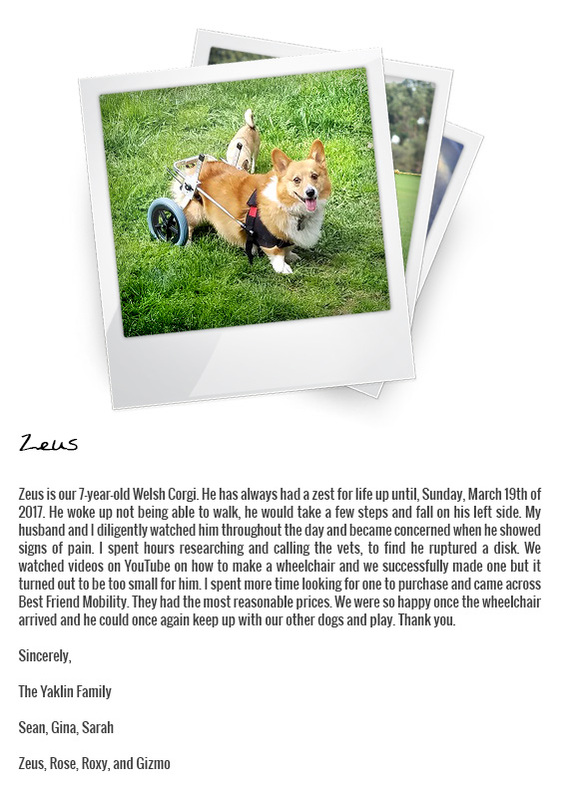 Thank you for providing a product that has given our best friend a new lease on life. This is Yuna, a black female pug. She is now 11 months old and recently had a spinal operation (in August 2017). Yuna needed help walking and these have helped her so much. We are still on the road to recovery and doing a lot of hydrotherapy and physio, and we are hopeful she will walk again. Max came into our life a few years ago; we got him from a shelter along with Coco. He likes to run and flop in the grass, especially when the sun is shining. Everyone in the neighborhood smiles and wants to pet him when they see him walking around the block. He is small but he has a big personality. Max is old now and his back legs stopped working. He can’t run like he used to so he mostly just sits at our feet. But now when he walks around the block in his wheelchair, everyone smiles even more. He is a star! Roxy has been to Cornwall, UK on holidays and paddled in the sea. Roxy has run alongside daddy on his mountain bike through forests and woods. 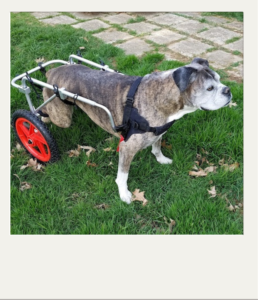 Roxy is now nearly 12 years old and had been as fit as a butcher’s dog until these last 6 months, where her arthritis and spinal chord problems have slowly led to her unable to use her hind legs. In the house, she slides around everywhere on wooden floors. 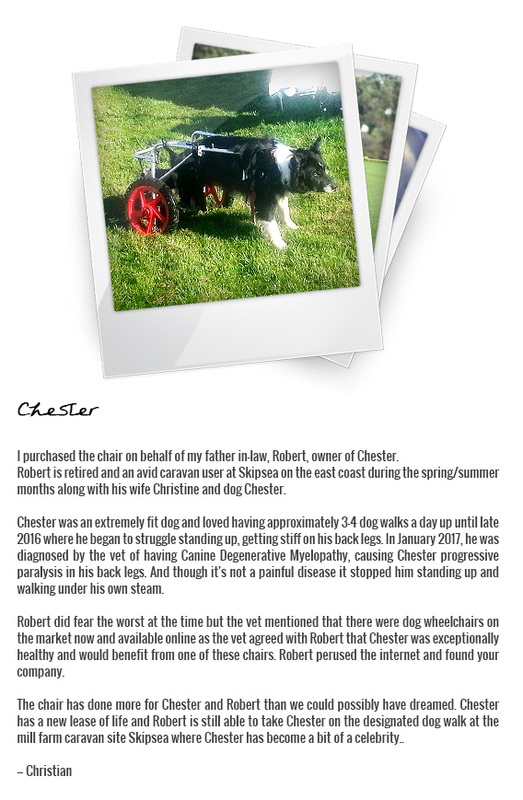 We purchased a mobility chair for Roxy and it has enabled her to for walks out now to her favourite parks and trails. The fuss Roxy gets in her mobility chair is unbelievable. She is loving all of it. We’ve had Roxy from a puppy of six weeks old. We have had the best years of our lives with Roxy; she is our family princess. 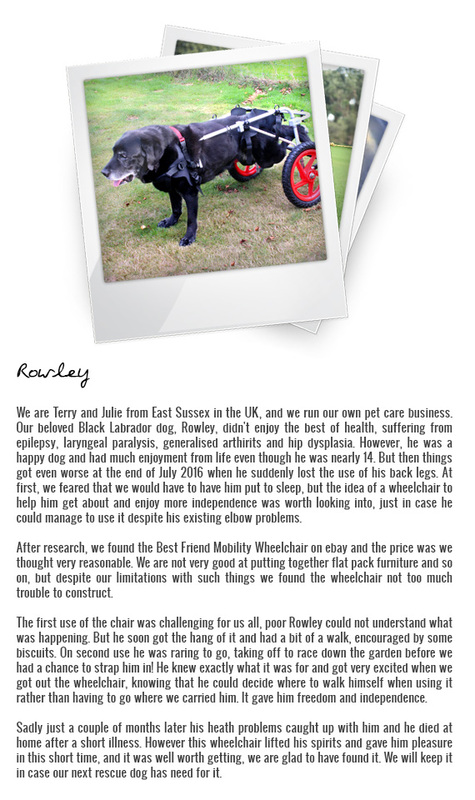 The mobility chair is a second lease of life for Roxy and has been a blessing. Saboo was brought to a shelter in the back of a pickup truck in February 2017. A rescue volunteer just happened to be there and was able to pull him into rescue, but it was soon evident that Saboo had neurologic problems. An MRI revealed a fairly rare condition, spinal arachnoid diverticulum. This can be a quickly progressive condition, eventually causing death, and Saboo was only about 18 months old. He had corrective surgery in April, and was completely paralyzed post-op. 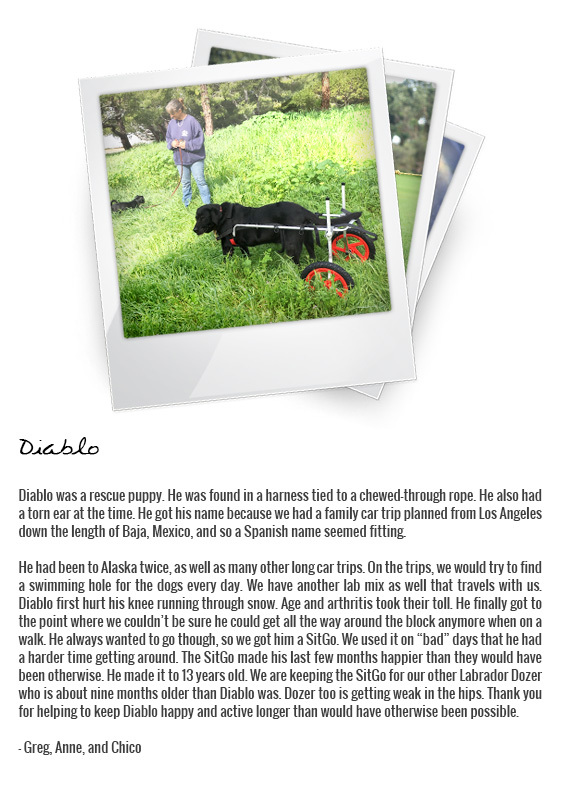 Many hours of rehabilitation, with the help of his Best Friend Mobility Cart, and Saboo was back to walking in 4 weeks—an amazing recovery. Saboo is a funny, sensitive, goofy boy, who loves everyone . . . and his squeaky tennis ball. A special thank you to Kodi’s Club Rescue for saving him and helping with his medical expenses. Sirius was a stray that showed up on our doorstep 8 years ago. We felt bad for her and initially had decided to let her stay in our 1-acre fenced-in back yard. Of course, it wasn’t long before she became an inside dog and joined became a full-fledged member of the family. In December of 2016, Sirius was out enjoying the backyard as she usually did. That evening I called for her to come inside for the night but she did not ever come. I was afraid that she may have found a way out of the fenced-in yard. I put on my shoes and walked out into the yard to look for her. I quickly found her sitting in the yard. I kept calling but she would only drag her rear end across the grass and whine. We took her to the vet early the next morning and they sent us to an emergency vet for x-rays and further testing. Months later we still have no real answer as to what actually has caused her paralysis. She has regained use of one of her rear legs. The other rear leg has little to no use. She continues physical therapy and we still hold hope that she will regain some use of that leg as well. In the meantime, our Best Friend Mobility wheelchair has been a godsend helping Sirius regain some of her mobility and keep her active. She loves being able to get out and move through the yard freely again. 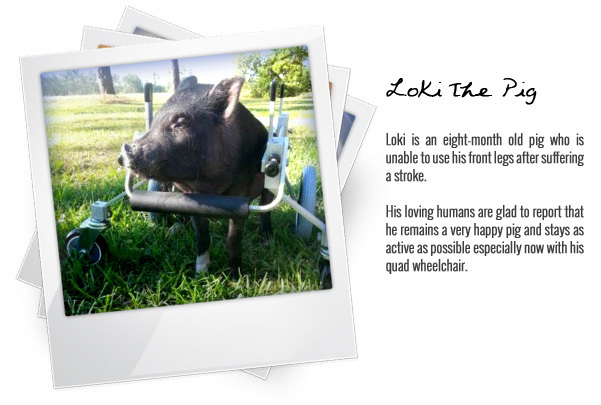 Loki was only barely 3 years old when he suffered a herniated disc in his back. He was also given an uncertain diagnosis of non-infectious meningiomyelitis from a neurologist in Calgary, Alberta. He had surgery to fix the slipped disc but treatments for his possible autoimmune condition were unsuccessful and his family is currently trying alternative treatments. In August 2016, Loki lost all strength in his hind legs, became very wobbly, and was unable to walk properly, dragging his hind end behind him to get around. He had a few remissions and fallbacks since then and now seems somewhat stable but without the use of his hind legs. 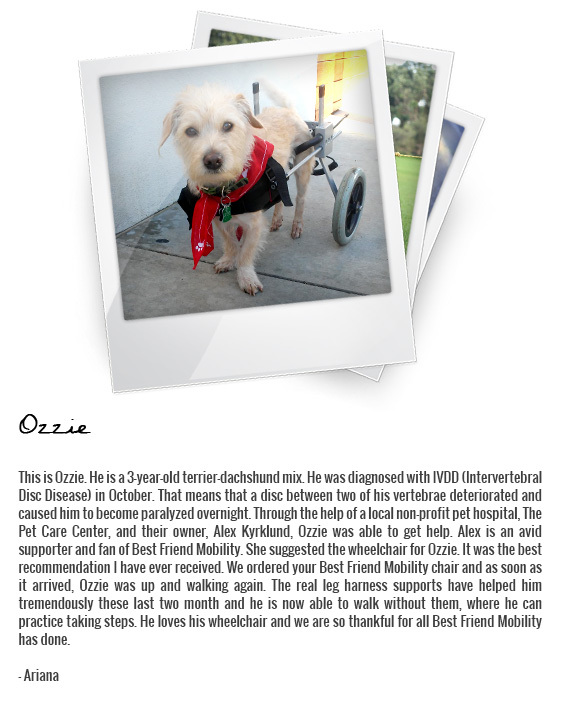 He received his wheelchair from Best Friend Mobility in December and took to it right away. Within minutes, he was playing fetch again and running around the yard with a big smile on his face. Loki’s wheelchair gave him back some of his independence and mobility that a sling does not offer. 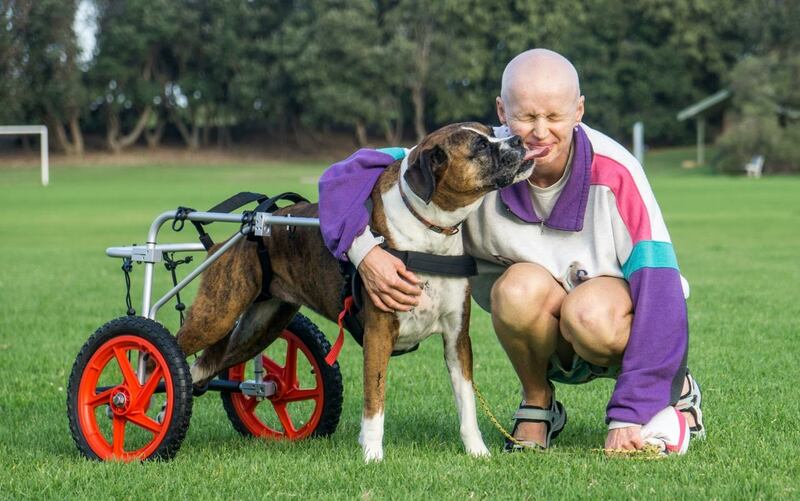 His family would like people in similar situations to know that just because a pet’s life has changed with a handicap, that doesn’t mean their life is over. Loki is very loved and happy, and will hopefully continue this way for a long time to come. Molly is a 13.5-year-old pug who lost the ability to use her back legs approximately 8 months ago. 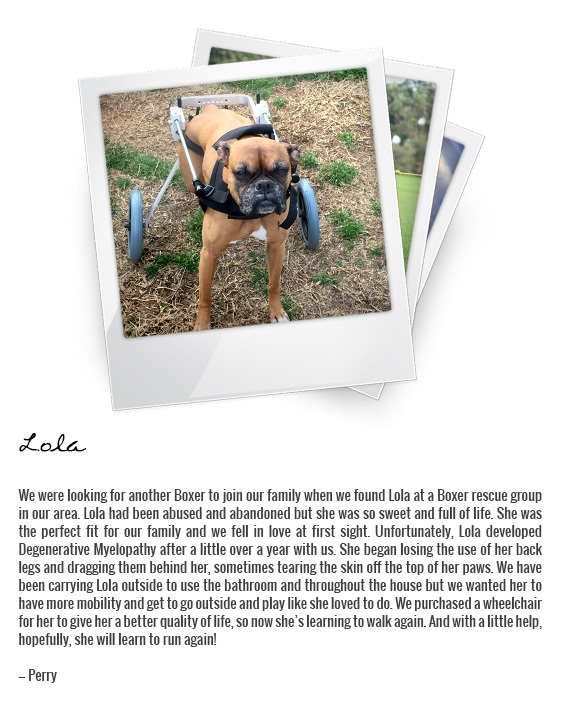 We decided to get her a dog wheelchair to see if it would help. Since using the cart she is now able to stand, eat and drink, and walk around the house. In her cart, her tail is always wagging (something we haven’t seen in a long time) and believe she is very happy. Using the cart has also helped strengthen her legs and she’s able to stand again on her own without the cart. We are overall very happy with the purchase and would do it again in a heartbeat! Ariel, a Daschund who is almost six, was a stray when she arrived at Nevada Humane Society Carson City earlier this month. Right away, the staff noticed something different—Ariel had no use of her back legs. Nevada Humane Society’s vet team say it isn’t a new condition and that Ariel has probably been like this for some time. No one came forward to claim Ariel, and she wasn’t microchipped. She acts completely normal and her resilience is strong. Knowing surgery wasn’t an option and that her quality of life was good, Nevada Humane Society ordered a wheelchair, size XXS, and it arrived Friday afternoon. Ariel was fitted to the chair, and then, as everyone watched, she raced down the hallway like she had been doing this for years. Her tail wagged nonstop, expressing the joy of her newfound freedom. Ariel can now get around normally. Whisky is our two and a half-year-old Beagle-Pekingese mix. On Valentine’s Day, we took Whisky and his sister, River, sledding. Running and romping, he herniated a disc in his lower back. He walked home just fine but hours later, we noticed he had trouble walking, collapsed, and then started dragging his legs behind himself. Not able to afford surgery, we looked into every option we could. We found the Best Friend Mobility SitGo and knew we found his best opportunity. This video is of his first time in his wheels, his new nickname has become Whisky Wheels. He’s our little lowrider hotrod. Bruiser is an 11- year-old Belgian Shepherd & Boxer mix. We took him to the vets to be told he has a brain tumor, which is why he loses his balance and his legs don’t work the way they should. He also has arthritis in the spine. We were told that he wasn’t in any pain, so I had seen your dog wheels and how they have helped and thought what a great idea. 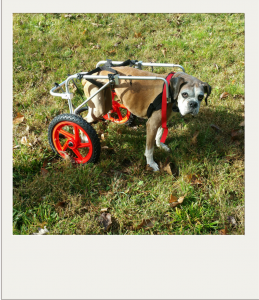 Bruiser just loves his wheels and he has been able to walk and play again. He is such a happier boy. I am so glad I got them for him. Gus is an eleven-year-old basset hound. He enjoys doing what all hound dogs do—sniffing out trouble! Gus suffered a back injury where he lost all movement in his back legs. He became visibly depressed over the course of about a week due to his immobility. The family vet was not optimistic about Gus regaining use of his legs again and was also not confident that surgery would be effective. He was still able to tell us when he had to go outside and was also eating and drinking. We decided we would try rehabilitation instead. We ordered him a set of dog “wheelies” (as we called them). His mood immediately changed and he was able to navigate the world on his own again. Through two months of rehabilitation and the use of the Best Friend mobility chair over the course of two months, Gus is able to walk on his own unassisted. My family and Gus would recommend Best Friend Mobility to any dog who had suffered a back injury! Tinkerbell is a 13-year-old Chihuahua who was unable to walk for nearly 3 months. She was brought to the vet numerous times regarding her back and how much pain she was in. She was unable to go down the stairs to go outside so we would have to carry her outside and hold her up to potty. 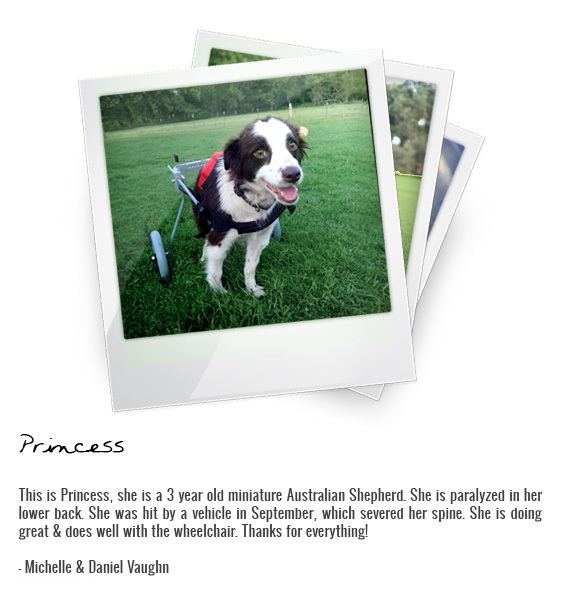 Once we got your wheelchair she was more comfortable with moving around and was able to start walking after 2 weeks. It was a blessing to have the wheelchair or we may have had to make a decision we were not ready to make for her safety and quality of her life. Tex is my beautiful best friend of 9.5 years. He was given to me as a puppy so have never been 100% what actual breed he is, but there would have to be a working dog in there. We have run thousands of kilometers together over the years due to my love of running and the beach and we’ve barely missed a day. Most days running morning and night and active all weekend with me. He has lots of human and dog friends all over the place. So it was completely heartbreaking and traumatic when Tex had a freak accident running for a ball while I was working away. His spinal cord was swollen with fluid leading to paralysis in his back legs, loss of sensation and the ability to walk, run or jump. As such an active dog, I grieved for him and had no idea what to do when my friend bought Tex a cart with harness and wheels and we haven’t looked back. It’s been 2.5 months and he has adapted so well he has movement and feeling back in his legs although he cannot hold his weight so future is still unclear. At this stage though, he is truly happy running in his cart along the beach and into the ocean. Good to see him happy in a difficult time. This email is to inform you of how deeply grateful I am for finding your product. 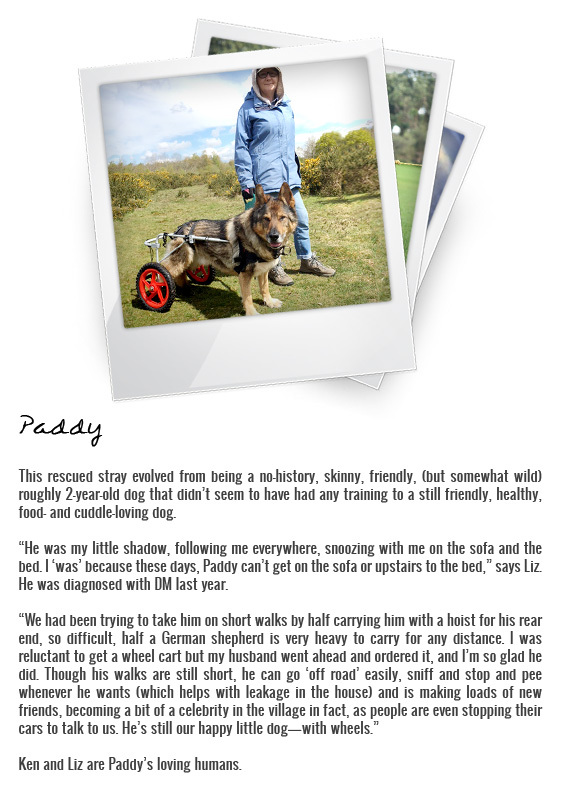 It has made a profound difference in Buddy’s day to day lifestyle. We went back and forth if the investment was worth the return due to Buddy’s age and the unknown if he would accept it. We couldn’t be more satisfied with the results. 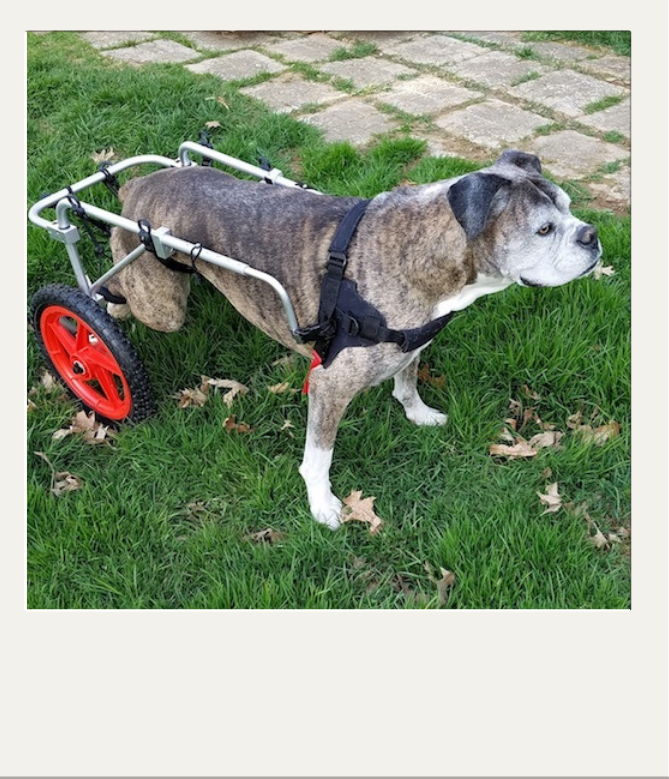 I would recommend this product to any and all pet owner that are faced with your dog having mobility issues. 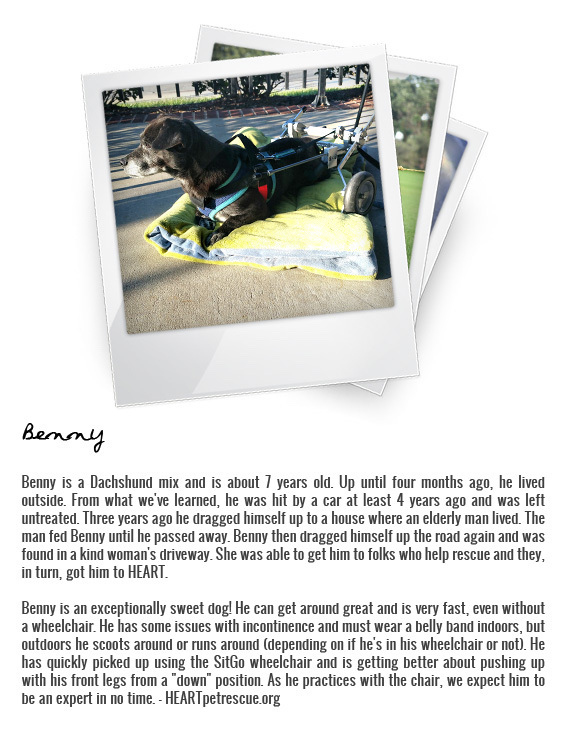 Please use these videos as testimonial on how it has made a difference for Buddy. 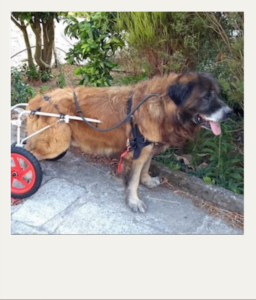 Briefly , Buddy is 14 years old and recently suffered from Myelomalacia a ruptured disc. He has been able to move around a few rooms but is has become very limited. Buddy has gone out on a walk every morning for 14 years. recently he could barely make it out the door before he was turning around to come back inside. My wife and I decided to purchase your product, praying that it would help. Cassie a.k.a Mutt Face and her lovely human, Debbie. © Copyright Dog Wheelchairs 2019. All rights reserved.